Yes, it really is! Clockify is the only time tracker that’s free for teams of all sizes. You and your team can use Clockify without ever paying a cent, even if you have hundreds of users! Use it as much as you want, for as long as you want, and we won’t charge a cent. In addition to the core features, you can extend Clockify with extra features to make life easier by upgrading to a paid account. If you didn’t get a verification email, check your junk/spam folder. If it’s not in there, you’ll have to change your log-in email, verify that email, and then you can revert back to the original log-in email. If you’re using a company email address, you should change your log-in email to your personal one just for a few minutes in order to finish verification, then you can safely switch back to the company email. Do you have free trial so I can try out the extra features? Absolutely! You can try out all the premium features for free for 7 days, no credit card required. How can I turn off time entry grouping? How to set time as billable by default? First, you have to mark each project as billable (you can do that by opening project page and checking the Billable checkbox). Then, each time you select the project in the time tracker, time will be marked as billable without you having to mark it as such. Also, you can set “New projects are by default: Billable” in workspace settings so you don’t forget to mark each project as billable. 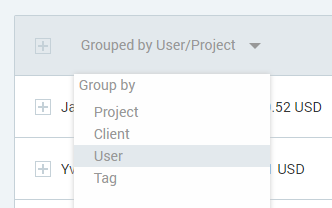 If you can’t see projects in the project picker on the time tracker page, check if you have Task as a required field enabled in your workspace settings. If Task is a required field, projects without any tasks won’t appear in the picker. To fix the issue, simply create tasks on a project and the projects will become available in the picker. To change currency, go to workspace settings. There, instead of “USD” type your own currency (eg. GBP). If the system recognizes your currency, it will display that currency’s symbol in bar charts; if not, it will display what you’ve typed. Can I import data from another system (like Toggl)? Officially, not yet. However, if you’re computer savvy and know your way around the command line, you can use Toggl to Clockify, an unofficial CLI tool to load Toggl data into Clockify. The project is developed and maintained by 3rd a party developer, so use at your own discretion. Does Clockify have timesheet approval/rejection features? Clockify doesn’t have approval features per se. Instead, the intended workflow is for admins to directly edit other people’s entries in the Detailed report if necessary. Then, at the end of the week/month, the admin locks timesheets. All entries that are locked are considered to be approved. You can also enable automatic lock so the lock date gets updated automatically every week/month. Can I change the user name for the people in my team? While admins can’t change other team member’s names, each user can change their name in their Personal settings (hover over profile picture and click Settings). This name is visible across multiple workspaces. Can I change the workspace owner? Yes, you can change the workspace owner when you go to the Team page, click the three little dots near the team member’s name whom you would like to set as the new Owner and select “Transfer owner role”. Sure thing. You can view the status of your subscription, edit the invoice information and download the invoice. To do this go to the Workspace page, click Settings of the Workspace you upgraded and you will see a Subscription Tab there. Click that and at the bottom of your page, you should be able to see your Past Billing Statements and the invoice you can download. You can cancel your subscription when you go to your Workspace Page, click the Settings of the workspace where you have a paid subscription and you will see a Subscription Tab there. Click that and at the bottom of the page you’ll find a Cancel Subscription link where you can cancel your subscription. Clockify won’t track and capture screenshots, only time logs that you manually enter. Clockify is completely private and trust-based, and doesn’t have any monitoring features (and we don’t plan to introduce them in the future). How can I can see an overview of all users and check who has not completed the minimum weekly hours? You can run the Weekly report and group it by user. The total at the bottom will show you how much everyone tracked that week. You can also see who tracked how much time in the Summary report (once you group it by user). There you can also choose a custom date in the upper right corner if you wish to see the hours by user for a specific period of time. There are also targets and reminders feature, which will alert your team members about their missing time logs (eg. they’ll get an email saying “You’ve tracked less than x hours last week”). How can managers see the statistics of their projects? Once you give manager rights, project managers can go to the Projects page and there they should be able to see a little chart icon under the Status column. Clicking on it will show them the project status. This icon shows up either if you’re an admin or a project manager. Do you allow for sub-categories on projects? You can use tasks on projects as subprojects if you need another hierarchy level. Or, you can use tags. What to do if I have multiple clients on one project? If you have standardized projects and have multiple clients attached to them, in that case, it’s better to use tasks instead of the Client field. Then, when tracking time, select the project and the corresponding task based on who’s the client. Another solution (perhaps even better) is to use tags. Tags work regardless of the project so you can create one tag, use it on multiple projects, and filter reports based on them. You can even use multiple tags to filter reports with more precision. Can I capture project expenses? Unfortunately, we do not support tracking costs, only billable hours. But, once we add Custom field feature, you’ll be able to add a separate field for expenses (or whatever else you want). We’ll also add the ability to enter labor costs so you can analyze project profitability. How can I account for break time in Clockify? Create a separate project where you’ll put all time entries for breaks (eg. spent 5h on ProjectA, 3h on ProjectB, and 1h on project Breaks). Create a “break” tag. Then employees can create a 1h time entry, leave it without a project, mark as nonbillable, and attach “break” tag. Later in reports, you can filter out entries with the “break” tag to calculate payroll or billable hours. 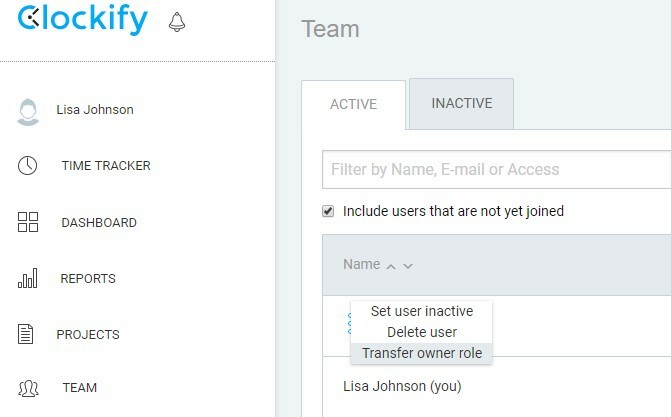 If a user is made inactive, is their time still included in reports? All time entries stay in the system and are displayed in the reports, no matter if a user is deleted/inactive, or if the project is archived or the task marked as done (entries disappear only when deleted manually, either by the user who created them or by admin). How can I share timesheets with my clients in real time? Can you disable the option to manually add time or edit time manually? Clockify is a trust-based time tracker so it’s not possible to disable manual time entry (as people will just find a way around the limitation, eg. start timer even if they haven’t started working). But, you can lock timesheets so no time entries can be added or edited after a certain period. Although you can’t see in reports which entries are placed manually and which ones through the timer, you’ll notice that all time entries that we made using a timer aren’t perfect (eg. they always have seconds, like 0:31:32) while entries that were entered manually have round numbers (eg. 0:30:00). Also, if you ask for all the time entries programmatically via the API, entries made in timer have microseconds which are not equal to 0. How can I suggest a feature / report a bug? We’re always open to feedback. Check out our roadmap to see what we’re working on, or suggest a feature/how to improve Clockify by filling our feedback form. If you notice that something doesn’t work as it should, send us an email at support@clockify.me describing the malfunction and how we can reproduce it. If you can’t log in, there’s the Forgot Password on the login screen. If you’re logged in, you can change your existing password in your User Settings (just hover over your profile picture and click Settings). If you’ve logged in with Google, but didn’t set a password, you can do so in your User Settings. Is it possible to download the data for personal backup? Yes, you can export all your data any time you want. Simply go to Detailed report, choose the biggest time frame possible, and click export (either as Excel or CSV). Completely safe. Your Clockify data is hosted on Amazon Web Services, so it’s as secure as it can get. Our servers are protected both physically and electronically. Any connection between you and Clockify is protected by 256-bit SSL encryption. There are also regular backups so you never have to worry about losing data. Read more about Clockify security here. Even though we’re a US-registered company, our servers are located in EU (more specifically, Germany). You can see that when you perform traceroute. Do you collect any private data? No, we don’t collect any private data. When you sign up for an account, we subscribe you to our newsletter, which you can unsubscribe at any time either from your User Settings page or directly from the email. You can also delete your account and all the data in it any time you want. How long is data stored and available for download? Data is stored indefinitely until you delete your account (or until the workspace owner deletes the workspace or their account). You can find API key in your account’s Personal Settings and API documentation here. 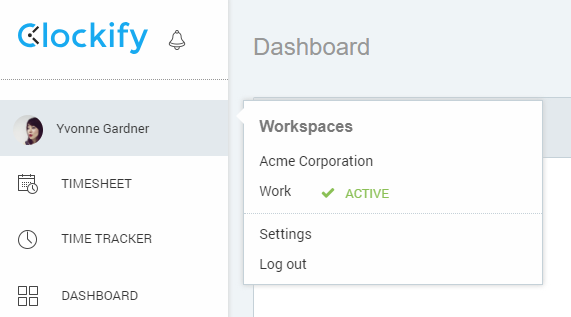 When a user already has an account, they need to accept your workspace invitation inside Clockify (and not via email) by clicking on the notification (bell icon) in the upper left corner. Once they accept the invite, they can switch to your workspace (and delete their own workspace) and start tracking time on your workspace. The email you used to create the account and the email your team used to invite you need to be the same. If they’re not the same, log out of the account you’ve created and click the invite again to create a different account using the email address your team used to invite you. If you already have the account, just log in and hover over notifications. You should be able to see and accept the invite from there. After that, hover over your profile image and switch to your team’s workspace (or go to Workspaces and activate your team’s workspace so you can start tracking time for your company).